You know, one thing I’ve discovered over my time writing this blog is that, even though I’ve traveled to numerous places and wrote about faraway sandwiches, sometimes the best ones come from your own backyard. One place in my new neighborhood that I’ve heard rave reviews about (from three different people without prompting) is a little mom and pop shop called HyMart Sandwiches and Mediterranean Fusion. Located on the corner of Vineland and Camarillo in North Hollywood, this shop is family run with ingredients imported directly from Turkey. Seeing as how I love Mediterranean (my favorite restaurant in the Valley is The Great Greek, an amazing and well-known restaurant), everything on the menu immediately grabbed my attention. The question was quickly becoming not which sandwich to choose, but how could I come back to try them all? 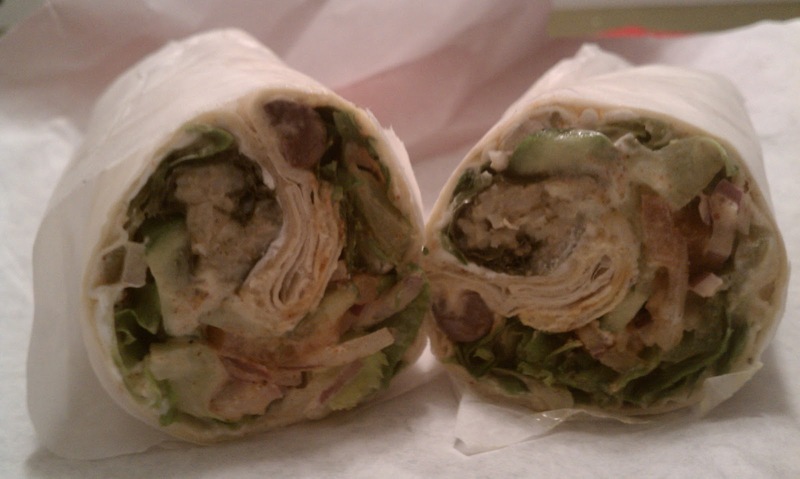 Finally I settled on the Mediterranean Madness wrap. Packed tightly with labni (a strained Greek yogurt), hummus, olives, lettuce, tomatoes, onions, cucumbers and stuffed grape leaves. Yes, stuffed grape leaves were the main ingredient to this sandwich. 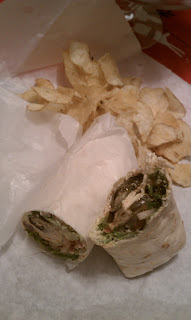 The vegetables used in this wrap where incredibly fresh. The onions and lettuce were crunchy, and the tomatoes used were not mealy but from perfectly ripened red tomatoes. The stuffed grape leaves, and there were a few to each sandwich, provided the bitter tang that grape leaves are known for with the wonderful spices of the Mediterranean with the seasoned rice insides. 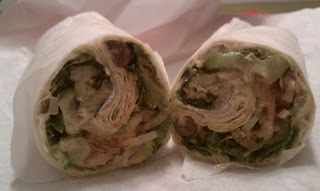 I would have taken an order of the grape leaves to go even without the sandwich. They are just that good. I also happened to order the spicy version of this sandwich. Now while I normally like spicy things, I think next time I order this I may hold back on the extra kick. While it wasn’t too spicy for me, I think the extra flavor brought from the added sauce overpowered some of the more mild flavors of the sandwich. Still an excellent sandwich though. And as an added bonus: Hy Mart has excellent service from a friendly family. There’s nothing better than supporting your local small business sandwich shops. And so ends another satisfying week here on The Danger Sandwich friends. On December 23rd, I will be heading back to the east coast to spend time with family over Christmas, so if you know of some good sandwich shops in the Philadelphia/New York/Washington DC area, let me know in the comments section so I can try some of your favorite places while I’m home.